After almost 22 years of service at Southern Illinois University Edwardsville, Vice Chancellor for Administration Kenneth Neher can say he’s leaving his job better off than when he first arrived. “I have enjoyed seeing the University grow and prosper,” said Neher, who likens himself to a mayor overseeing the “small city” of SIUE. Neher will retire from the University, effective July 1. 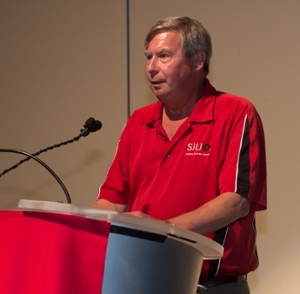 Neher recalls when he first arrived at SIUE. He said the parking lots, landscaping and buildings were in need of repair and refurbishing. 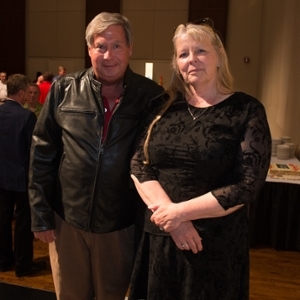 From the first day that Neher started working at SIUE in August 1994, the vice chancellor for administration decided he would make enhancements to the budding campus. Neher has done that and more. “I’m especially pleased that during my tenure, I have seen improvements to old buildings and the addition of new ones,” Neher said. Some highlights at SIUE under Neher’s administration include the University’s growth from one residence hall to four. SIUE has also seen additions to its Engineering Building, Science Building, expansion of its infrastructure and received national acclaim for its landscaping. “I was looking for a career where I could employ the skills I learned as a base commander in the Air Force,” added Neher, “and one that would be for a worthwhile purpose.” Neher served in the U.S. Air Force for more than 27 years and retired as a colonel. Neher is quick to add that all the advancements and accomplishments made during his tenure at SIUE would not have been possible without the hundreds of people who worked on his staff and all the other University employees who are committed to providing quality, affordable education on a beautiful, spacious and well-maintained campus. As for what’s up the road for the former vice chancellor for administration? Literally – “the road.” An avid motorcyclist, Neher plans to don his black motorcycle jacket and hit the highway. Neher talks about his career at SIUE. Neher is pictured with Dawn Greenwood.